Security is the main thing for servers and SQL servers and we need to trace it for security management. Have to need track who is using it, what they are doing and when they performed. For SQL Server 2005 and later versions we have some DDL events which can help us to achieve this. So let us catch it up. But before going ahead, please visit DDL Trigger and DDL Auditing in SQL Server 2005 and Logon trigger in SQL Server for more information about DDL trigger. We are capturing some data which is full information of login name , the events occurred and the date on which it occurred and who did. I collected some snaps after performing and testing some scenario for creating a login, assigning server roles and finally deleting created login after testing, Let me share here. Above are the alert emails which I received for the events happened to create login, server role assignment and after all deleting the login. If we do not want to continue receiving the alerts for change, then it DDL trigger on the server can be disabled with following statement. 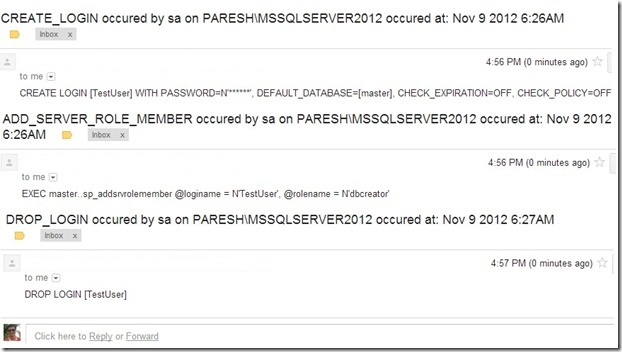 Did you configure any alerts for such DDL events? Share your thoughts here.